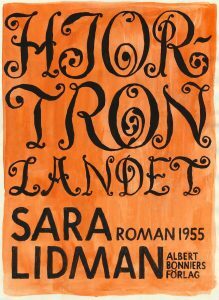 Hjortronlandet is Sara Lidman’s second book and generally regarded as her most distinguished one. With a unique and impressive language she depicts the lives of impoverished tenant farmers in her former home province in the North of Sweden. The destinies of five families are told in parallel fashion: all had come in order to settle in the meager countryside, cultivate it successfully and hope to become the rightful owners in the end. The main character Claudette is born as the daughter of the most productive tenant, Franz, and his second wife, Frida. The story is largely told from her perspective including her experiences of the rough environment and living conditions. The tense atmosphere due to the social struggles is adding to a very strong depiction of the human soul with all its interpretations and distortions. Many problems arise from perceiving the own truth as an objective truth; in fact a common feature of the works of Sara Lidman. Franz is deeply absorbed in his work, joylessly trying to outplay everyone else and to scale up as the first free tenant. His father Stefan is married to Anna, who is well known for being a strong woman, midwife and wise woman. Then there is the family of Jani and Stina who make the place worth living – they are efficient, they are able to fight and agree with each other again, they carry out conflicts in public.